Sister Madonna was born and raised in Mott, North Dakota. She had three sisters and two brothers. One brother died at birth; another was killed in World War II, in the South Pacific, when Sister Madonna was 16. Sister Madonna attended public school. She had a sister and friends who were nurses and found that she, too, was attracted to a career in nursing. Sister Madonna first came into contact with nuns when they came to teach vacation bible school in her area. Although by then Sister Madonna was too old to attend, she did drive a car, and was given the task of transporting the nuns to and from various locations, and in this way she got to know them. During her senior year in high school, the Benedictine sisters were in the process of separating from St. Benedict’s Monastery in Minnesota. The sisters encouraged Sister Madonna to consider becoming a sister. Sister Madonna was particularly attracted because of their connection with St. Alexius Hospital, especially when she found out that she could become an aspirant and start her nurse’s training at the same time. At the end of her freshman year as a nurse, Sister Madonna entered the novitiate at St. Benedict’s. After the novitiate, she continued her nurse’s training, and completed her nursing certification in 1950. At that time, small-town hospitals were being built in North Dakota. The Hill-Burton Act provided government funding for rural hospitals. The Garrison Dam was also being built at that time. A hospital in Riverdale, next to the site of the dam, was operated by the Sisters of Annunciation Monastery, and Sister Madonna was sent there as a nurse. One of her primary responsibilities there involved working at the first aid station which served the men working on the dam who were in need of first aid or other medical treatment in connection with their work. While Sister Madonna was at Riverdale, it was determined that nurse anesthetists were needed, and she was sent to school in Springfield, Illinois to be trained. 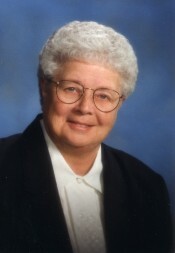 Sister Madonna has been involved in nursing at St. Alexius Hospital as well as at Richardton, and was instrumental in starting the hospital at Garrison, which opened in 1952 with only two nurses. Sister Madonna was one of them. Sister Madonna eventually became the Director of Nursing at Garrison Hospital, and also served there as a nurse anesthetist. hospital’s needs in the areas of spiritual care and medical records. Now semi-retired, Sister Madonna has more time to enjoy her other interests, especially amateur bird-watching. Sister Madonna has always had a keen interest in wildlife. She recalls going hunting and fishing with her dad, and remembers the early years in Garrison when she did a lot of fishing, even ice fishing on the lake. She recalls happy memories of a homemade houseboat, affectionately called “the barge,” “We spent a lot of time out there,” she remembers, “docked in the bay with a nice swimming spot.” Besides these activities which Sister Madonna has enjoyed with other sisters, she has also participated extensively in growing fruit and vegetables in the sisters’ garden. Sister Madonna returned home to Annunciation Monastery in Bismarck and enjoys helping in the kitchen and other areas where she is needed. Regarding the future, Sister Madonna’s perspective is both hopeful and honest. “I don’t know how the future will look,” she says, but she does look forward to the continuation of the health care ministry by the Benedictine Sisters of Annunciation Monastery.